With men becoming increasingly interested in the clothes and accessories that they wear, a men's tanzanite gemstone ring is not a very rare sight today. The MAN61 is surely the first and most luxury oriented custom men's ring that you will come across. The ring addresses the main issues that would need to be considered when designing and crafting men's jewelry. The most important thing is that, every feature in this ring including the basic design concept, the size of the gemstone, the choice of side gems or diamonds and even the metal in which the tanzanite men's ring is crafted, can all be decided by you. The ring as shown in the image is set with a 6mm cushion cut tanzanite gem, on either side are three princess cut expertly selected diamonds. Since each men's ring is made to order, you can request for a 7mm or larger tanzanite gem too, the side diamonds can be left ouf of the design or replaced with other gems of your choice. These changes will surely affect the price tag of the gold or 925 silver tanzanite ring for men but, our support team is always available to guide you and make constructive suggestions. We will not pressure you into rushing a purchase, take your time and ask your questions, it does not matter if you do not make any purchase in the end. Make sure that your preferences get priority and that, all your queries are answered. You could even request a phone discussion with our English speaking experts, we will make the call based on time suitable to you, differences in time zones will not affect our commitment to serve you. The ring is custom made in 14k or 18k white, yellow or pink gold, sterling silver is also available. 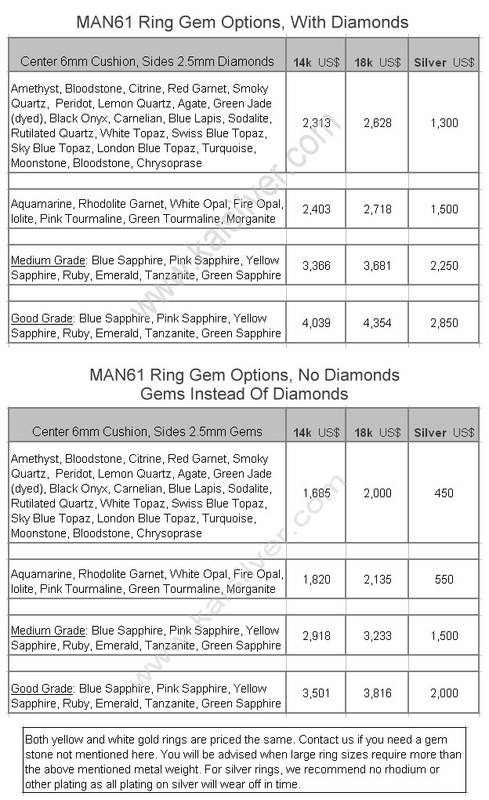 Request for a price quote if you would prefer to have a 10k yellow, rose or white gold ring. 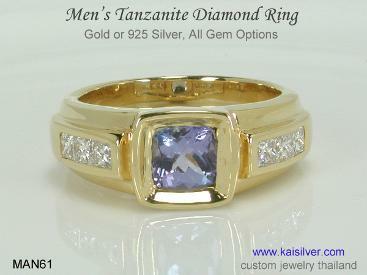 Same quality standards are maintained for the gold or 925 silver tanzanite men's ring. The center gemstone is a 6mm cushion tanzanite gem, you can request for a 7-8mm gemstone. Since each men's ring is made to order, you can select any gemstone and not just tanzanite. The men's gemstone ring is strong and sturdy, supported with a weight of around 20-25 grams. The head height of the ring is around 9mm and the portion behind the finger is about 6mm wide. You can request for a short name or message to be etched inside the band at no extra charge. All design modifications and ring sizes can be accommodated for this Kaisilver men's ring. Durability Features: Most jewelers would avoid or casually glide above the very importing issue of ring durability. 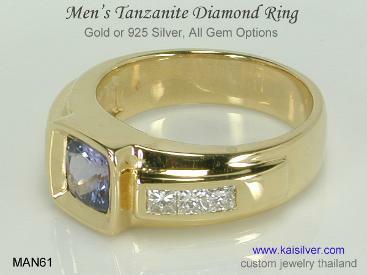 Kaisilver was the first men's jewelry provider to bring the concept of fine quality jewelry to men's rings. Our experts review each design based on style, wearing comfort and long term usage. Men generally do not fuss or become over cautious with their accessories, they probably pamper their car or designer shoes more than the jewels that they wear. Keeping this is mind we have provided some very vital features in the MAN61 tanzanite men's ring, these go a long wear in making the ring more durable and providing stress free wear. The 20-25 grams metal weight gives sufficient thickness and toughness to the ring, there is little chance of your custom tanzanite ring bending or deforming. You could request for a ring with absolutely no metal scooping done inside the band too, this might involve additional metal weight in the case of large ring sizes. Most rings ignore the portion behind the finger, a very narrow and thin band at that point can cause the ring to dent or even snap. This Kaisilver men's ring has a 6mm band width behind the finger, something that makes it very long lasting and comfortable to wear. Notice how the center gem and side diamonds are set into the metal, they do not protrude beyond the ring surface. This drastically reduces or even eliminates, the possibility of the ring getting damaged by physical impact. In the case of big rings that require very large sizes in the U.S size 12 to 16 range, we might recommend an additional metal weight. The idea is to maintain the durability of the ring across all dimensions and sizes. Buying From Kaisilver: We encourage you to discuss your preferences with our support team at sales@kaisilver.com The hurried Buy Now, Express Pay modes are not suitable when you plan to invest in a high end jewel. Provide as many details as possible, let our experts come up with suggestions and options. Do this until you have all your questions answered. You could also request for an English speaking support staff to call you on the telephone. Email details of your requirements, mention your location and phone number and state a time (your time zone) suitable for you to receive the call. We will take care of time zone differences and call at your preferred time. The details you provide in the email, will allow us to pick the right expert to call you. It will also give them an opportunity to keep all relevant information ready. Since your tanzanite men's ring would be completely custom made, we require around 4-6 weeks for production, this process will begin after payment is received to confirm the order. We accept payments through Paypal, Western Union and direct bank transfers. Paypal is the most preferred payment mode for first time buyers. Let us know which type of payment process you prefer, we will provide details for the same. Once ready, your merchandise will ship through FEDEX with web tracking and you will receive the tracking number the moment the parcel ships. A shipping fee of 35 U.S$ generally covers expenses for worldwide shipments. You will be informed about the shipping charges before, you confirm the order and make payment. Blue sapphires might be gorgeous but, style gets prettier when you wear pink sapphire. 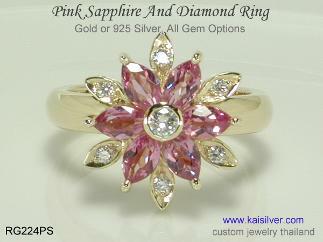 Any ring from the Kaisilver Sapphire Ring Collection, can be ordered with a white, blue, pink, green, yellow or orange color sapphire gems ... more. Jade a historically known gem has always been associated with serenity and good health. 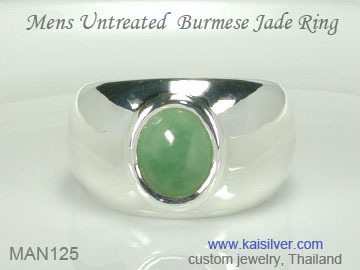 We offer custom gold and silver jade rings with natural jadeite from Burma. Review this and other men's rings in our collection ... more.